Most remember where they were and what they were doing when something monumental happens in their life. For anyone who lived in the Twin Lakes Area 10 years ago today, it was the start of what has been called the worst disaster ever. The ice storm of 2009 began late on Jan. 26th, but Jan. 27th was when the heavy freezing rain started. By that night, it was evident this storm was something like we had never seen. Joe Bodenhamer was serving as Baxter County judge at the time. The ice storm affected just about every aspect of everyday life. Many were without power for days and even weeks. Phone service was out for days for many residents. You couldn't drive, not only because of the ice on the roads, but because trees and power poles were falling and blocking roads. Emergency personnel couldn't reach victims. Schools were closed for over a week. You didn't have heat unless you had a fireplace or wood stove. If you relied on a well, you were without water because of the power outages. Because of ice on our towers, our radio signal was weak, so we put all the news and information on ktlo.com. But this was before most people had a smartphone, and unless you had power for your computer, you couldn't get the news. Bodenhamer says once the severity of the ice storm was realized, officials had to quickly determine how best to help the citizens. Reports at the time estimated over 400,000 homes in northern Arkansas lost power, and over 30,000 power poles were downed or snapped. 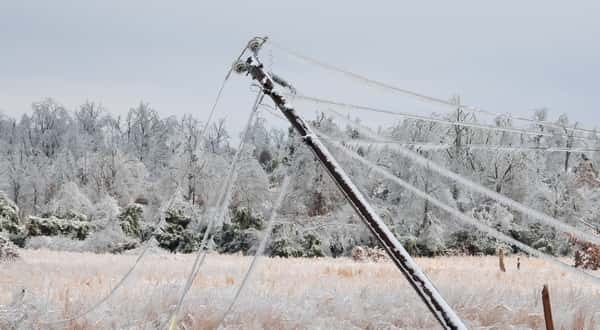 Mel Coleman, CEO of North Arkansas Electric Cooperative, says the ice storm of 2009 is by far the worst catastrophe in the history of the co-op, as 97 percent of its customers lost power. Coleman says the damage was like nothing they had ever seen. The clean up from the debris left from trees falling from the weight of the ice took most of the year. Cities and counties designated areas where storm debris could be taken. Many residents piled the debris in their yard waiting for contract crews from the Federal Emergency Management Agency to pick it up. In part two of our series on the 10th anniversary of the 2009 ice storm, Bodenhamer and Coleman speak about what they learned from the event, and a meteorologist from the National Weather Service reflects on the storm.